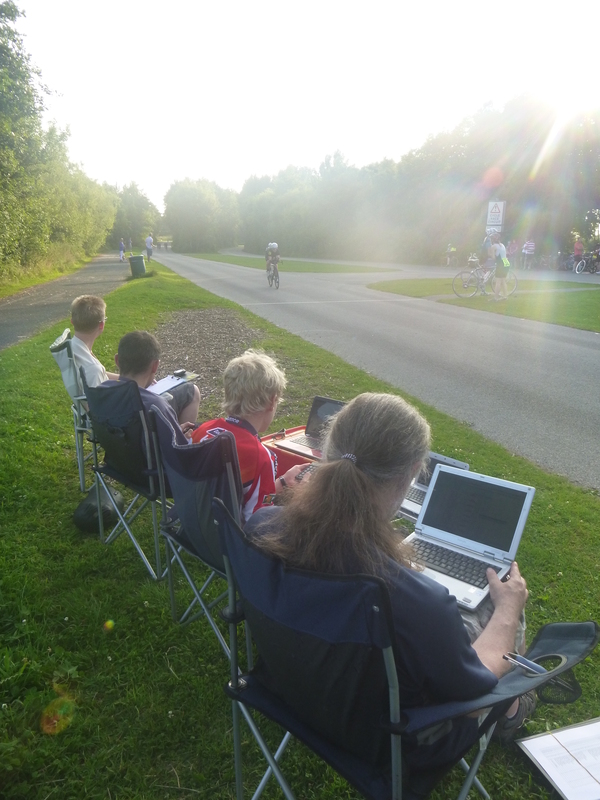 The Thursday evening time trial at Salt Ayre is becoming a regular activity for our household this year.We went again last week. It’s a wonderful occasion – people gradually arrive and assemble on the grass close to the starting line. For those who plan to ride, there’s the pleasant anticipation of giving your all, and perhaps even (on a windless night) beating your own personal best (PB). But this is a sociable place too – it gives us a chance to natter with old friends, as well as gently to intermingle, and gradually perhaps to develop ease and familiarity with a whole new set of friendly faces. (We’re always – with varying degrees of comfort – easing ourselves into and out of identities – and how lovely it is to see young people, especially, developing bike-based identities.) It really is a most agreeable scene. A lot goes on to make these events happen, of course. 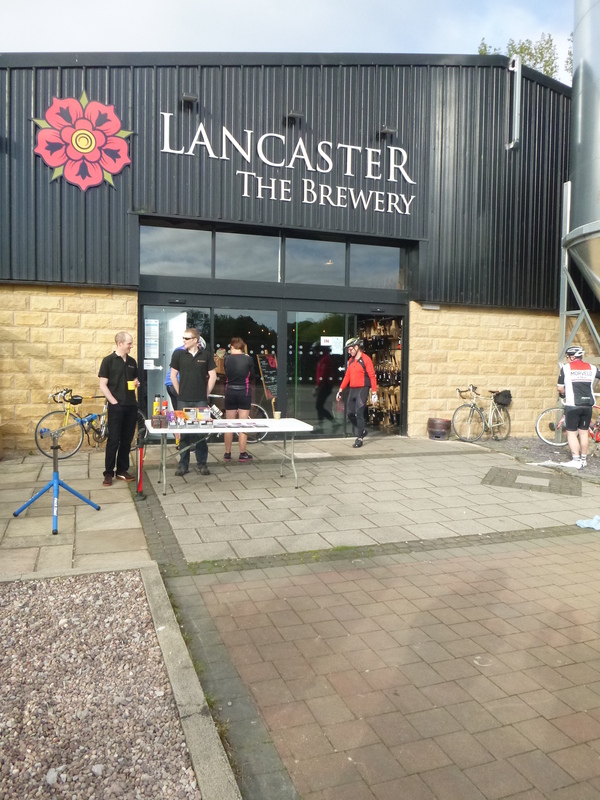 They depend on a dedicated band of wonderful volunteers from Salt Ayre Cog Set and Lancaster Cycling Club, who must arrive early to set everything up and await the riders’ arrival. Some people set up and staff the desk where riders sign in, pay for their ride (£2.50 for adults, £1 for children), and collect their number (all riders now have a small number which is pinned onto the top left shoulder of their jersey, so that it can easily be seen by the team of time-keepers who must keep track of the riders’ progress around the 0.8 mile circuit; riders in the 6 mile and 10 mile time trials also have a larger number, which is pinned onto the back of their jersey). 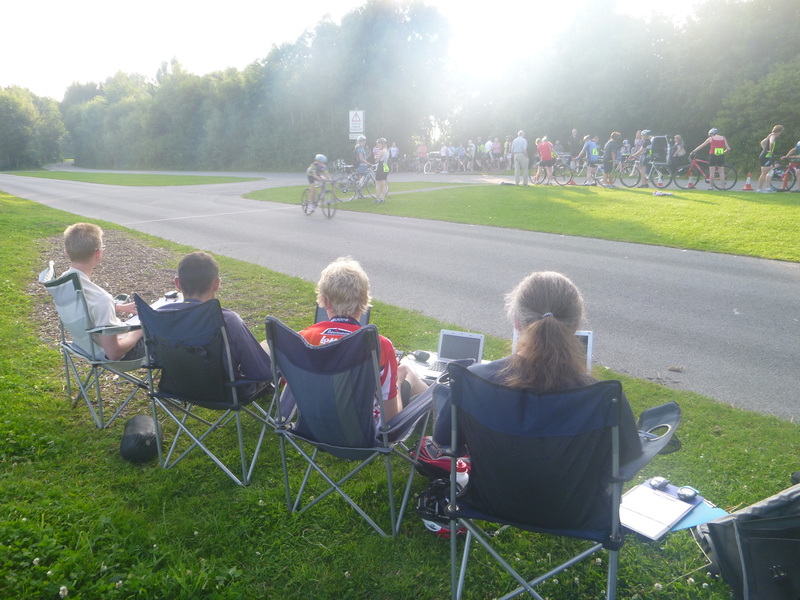 The time-keeping team establish themselves adjacent to the finish line. The area which they inhabit is cordoned off, to discourage interference. (But it’s great that the finish line is so close to the start line as it means that they nonetheless remain part of, rather than separate from, the happy scene.) The time-keepers’ task is a demanding one, requiring uninterrupted concentration. 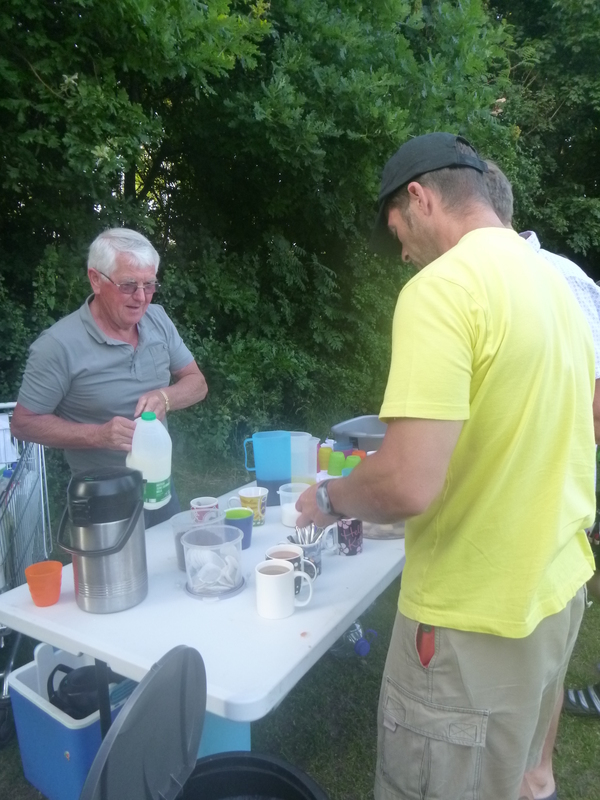 The team, led by the seemingly indefatigable and definitely indispensable Bob Muir, have honed their craft as these Thursday night events have grown increasingly popular, and their task therefore more complicated. 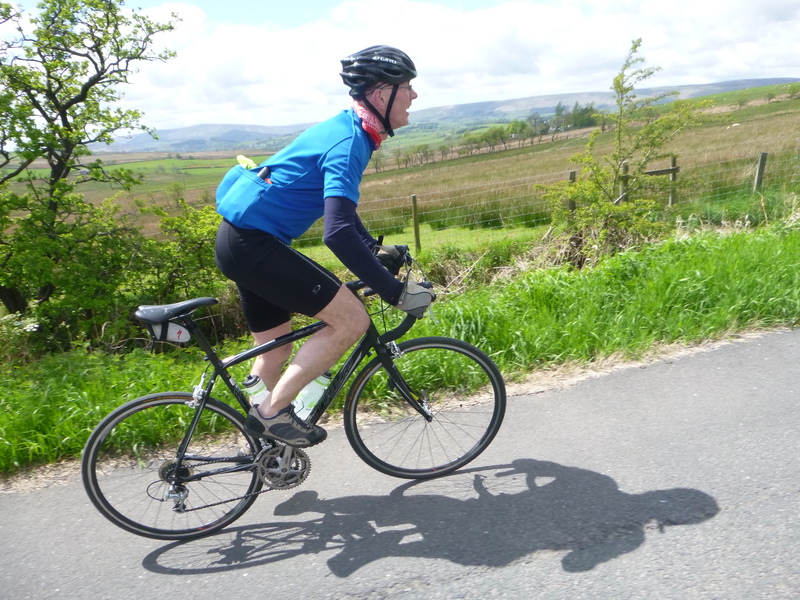 The pattern which has become established is this – the first riders to race are those doing two miles (two and a half laps); they are followed by those doing six miles (seven and a half laps); and then finally, riders completing a ten-mile time trial (twelve and a half laps). 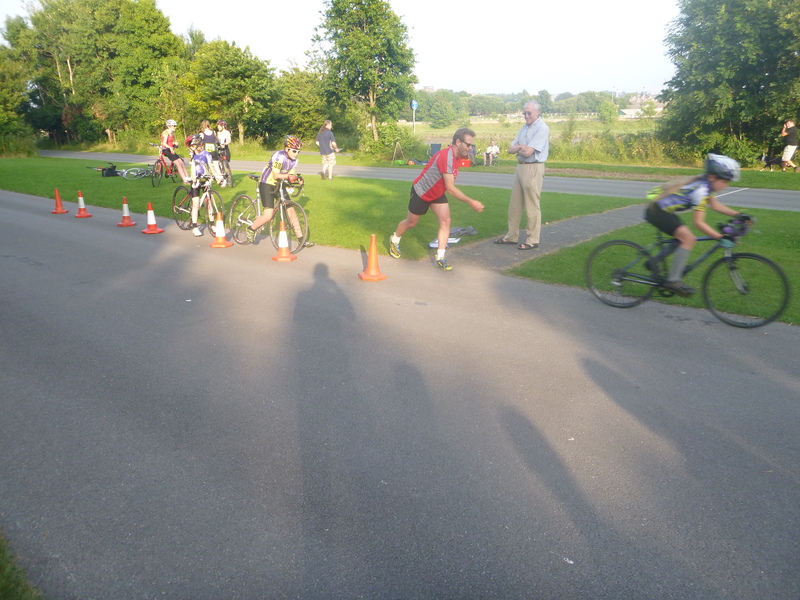 On Thursday there were 60 riders in total. They leave at one minute intervals, so there are always many riders on the track at any time. The time-keepers cannot snooze! There are other helpers too. To one side is a refreshment table for tea, coffee, squash and biscuits. Some people organise this. And there is always a ‘starter’ – someone to hold you upright on your bike, enabling you to clip fully in before beginning your ride, and ensuring you start at the right time. All starters have their own style, and all riders their own ways of interacting with them. Some starters hold only onto your seat tube; others steady the front as well as the rear of your bike. Some start to rock you gently back and forth as your start time approaches; others hold you steady as a rock until it’s time for you to burst free. Your departure is sometimes accompanied by ‘good luck’, or ‘have a good ride’. I’m not sure I should admit how I love the fleeting intimacy of this relationship – between you as the rider about to explode off the line and the person tasked with holding you there, keeping you safe and facilitating a smooth transition from stillness into flow. No doubt we all differ in this, but I am happiest when I feel able to place my left hand on the starter’s right shoulder. By this the already intimate relationship between us becomes unambiguously physical. As a rider I feel that I am thus more obviously seeking support. And I like to think that the bond between us, however it may or may not develop into the future, becomes just that little bit stronger. Besides, I’m a wobbly bike rider at the best of times! Relationships matter, in cycling as in life. For all its apparent individualism, time-trialling is no different. It would not exist without close and abiding relationships of solidarity and loyalty between specific people. So I’ll say it now in case I forget to say it later – I thank and salute all those who work so hard, week in, week out, to make these (and similar) events happen. They have become a central part of my own family’s life, and they are a central part of the cycling culture which many people are working in many ways to establish and broaden in this part of the world. The first riders to go are the two-milers. Here’s Flo, who set off at 7:04 (number 4), during her race. Flo is 7. Those riding the two-mile time trial tend to be younger children. Riding smaller bikes, with smaller gears, and using little legs, two miles is enough. Most important is that they’re participating, developing a sense of the capabilities of their bodies, and having fun. During her first few time trials, Flo would ride past us with a look of absolute joy on her face. When we asked her about this, she told us that having people cheering her on made her break out in an involuntary smile. I’m not sure whether or not I’m pleased that she’s since learned to control herself, and take the whole thing more seriously! Last week she was a little disappointed with her time. After getting a PB of 8 minutes and 52 seconds in windy conditions the previous week, she was 18 seconds slower. One of the many fantastic things about these events is how they’ve become really inclusive. Time trialling might have traditionally been seen as rather an isolated endeavour – one person (most commonly a man) alone on the road, riding against the watch. There’s nothing wrong in this, but Thursday nights feel quite different – many families participate, some with three generations. Because the event takes place on a purpose-built cycle track, young children who are not allowed to race on the roads can participate. And – thanks in large part to the superb efforts of Salt Ayre Cog Set in introducing children across our district to the thrills of cycling – many are doing so, along with their friends, siblings, parents, grand-parents and other relatives. Bobby, who’s 9, has this year graduated to the six-mile time trial. In the photo above he’s alongside Ffion, who is in his class at school, before their rides. 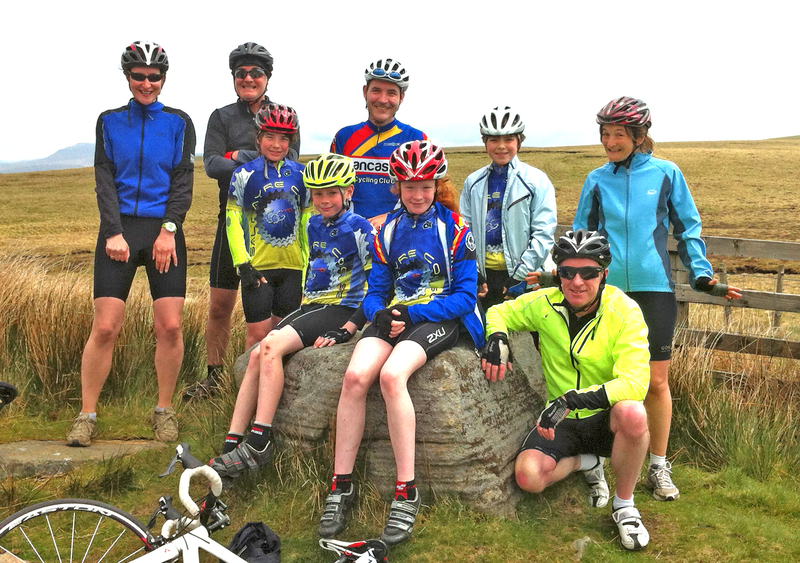 Salt Ayre Thursday time trials also seem to be becoming a family affair in Ffion’s house. Ffion has been riding six miles whilst her Dad, Andrew, rides the ten. 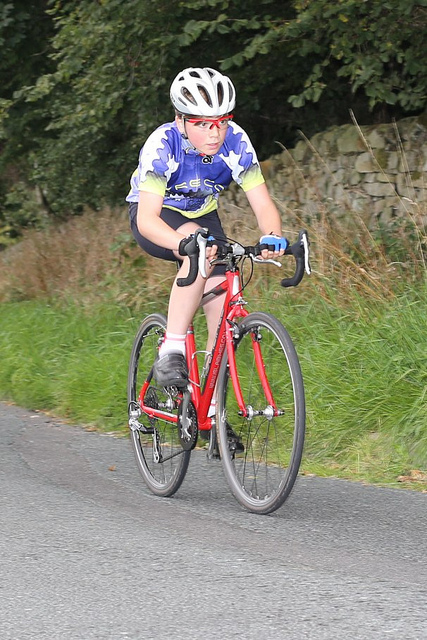 This week Ffion’s brother Rhys, who’s 6, had his first go – and looked like he was having a wild time as he rode 2 miles in an excellent 9 minutes and 21 seconds. Meanwhile Mum, Sandra, had a go at a time trial for the very first time, completing ten miles in a highly respectable 32 minutes and 21 seconds. Here’s another way in which these events are reaching out and embracing people who might otherwise never have found the pleasures of competitive cycling. They are creating a family friendly atmosphere and a safe, welcoming environment, in which ‘entering into the spirit’ and ‘having a go’ is really all that matters. And because of this, new people are coming to cycling, and breathing fresh life into cycling, including people who perhaps wouldn’t be seen dead in a skin-suit and who might hate the idea of banging up and down a distant dual-carriageway early on a Sunday morning. Bobby set off at 7:21, and had a great ride, recording 21 minutes and 2 seconds for the six miles, beating his previous personal best by 21 seconds. I’ve been very impressed by how naturally he’s stepped up to the longer distance, so that already he seems to treat racing over six miles rather than two as entirely normal. Here he is having finished, looking suitably pleased with himself. Sue was our next household member to go, setting off for ten miles at 7:44. I don’t want to hark on about the achievements of our particular family; as I’ve said already, for many of those taking part this event has become a distinctly family affair, and everyone, younger and older, slower and faster, achieves something real and important, and has lots of interesting stories to tell. But that said, the stories I know best are those closest to me, so what I will say about Sue is how she didn’t ride a time trial until she was past forty, how she barely trains (we go out for occasional rides together, and also as a family, but she doesn’t put in the long hours in the saddle which I am wont to do), how as a child and indeed for most of her life she’d never have considered herself as ‘sporty’ or ‘athletic’. And yet, having easy access to events such as this helps to make her so, both ‘athletic’ and ‘sporty’. 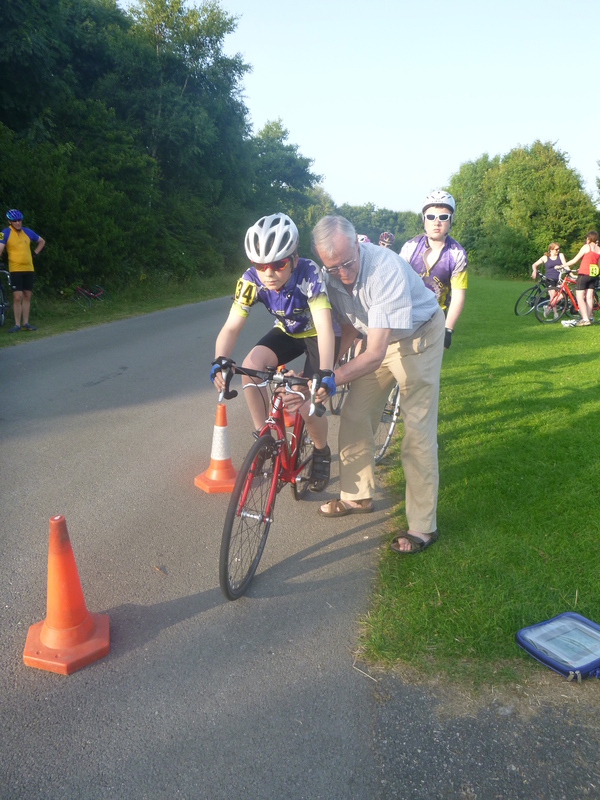 In providing an inclusive and safe space a short ride from our home, where anyone can give cycle sport a go, the Salt Ayre Thursday evening time trials are democratising activity, health, fitness, and cycling. I’m not saying there are no ‘barriers to entry’. To say so would be for anyone naive, but for a sociologist inexcusable. Clearly, all kinds of people for all kinds of reasons will feel uncomfortable in hopping onto a bike and trying to ride it as fast as they’re able around a track, as part of an organised event. But there is very clear evidence from the people who are participating that the Thursday evening time trials are succeeding in significantly lowering those barriers which once existed, and thus enabling a greater range of people to jump over them, onto a bike. I hope I don’t sound patronising. My point is that occasions such as these should not only be celebrated, but actively supported and encouraged. 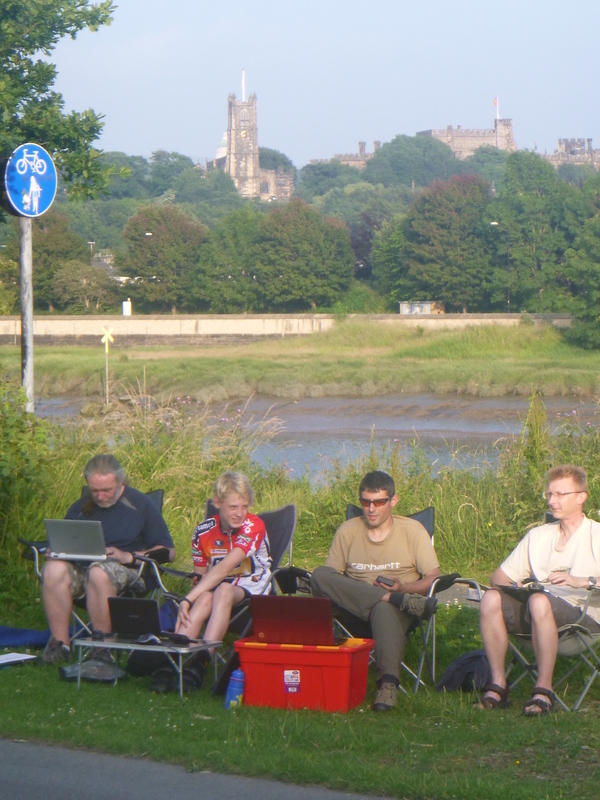 What value should we – whether as individuals, as families, as communities, or as a society – put on a regular time and place in which different members of a family can come together and take part in the ‘same’ event? An event in which everyone can have a go? The reasons people ride, how they ride, their experiences of riding, and what they’re getting out of riding will probably all be different. But these differences don’t eclipse the undoubted fact that such riding is similarly good for us. In a healthy society such events would be at the centre of every community. Over an hour after Flo, I was last of our family to set off. I finished in a time of 25 minutes and 56 seconds. Fastest 10 miler of the night was John Ingham, in 22 minutes and 31 seconds. 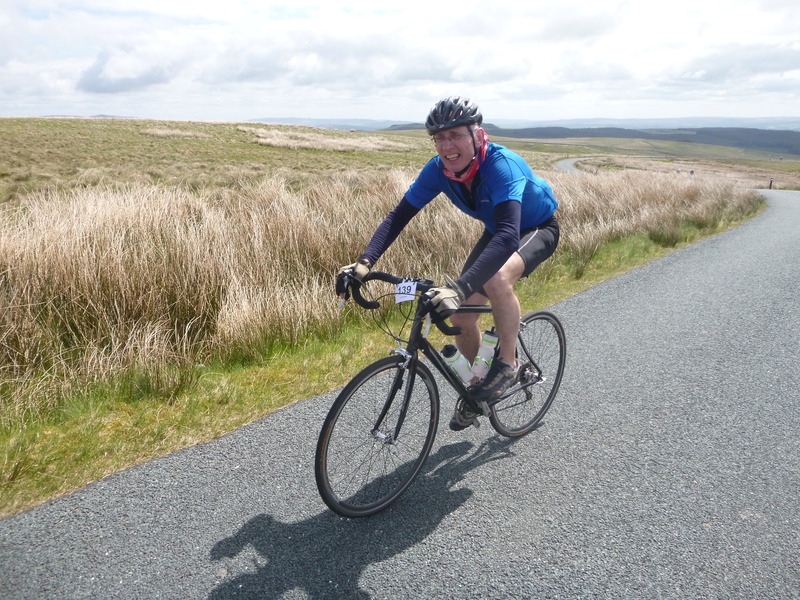 I’ll write in more detail about my own experiences of riding time trials at Salt Ayre some other time. 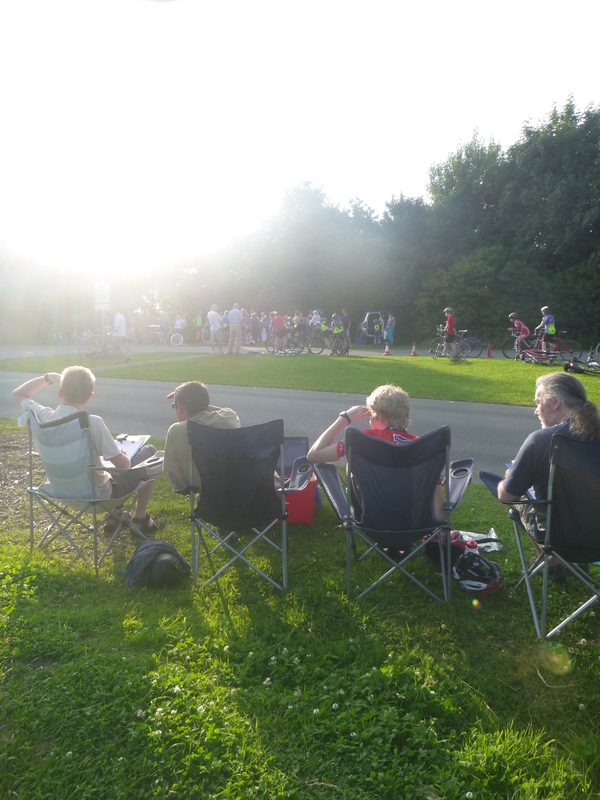 The key point for now is that Thursday night cycling at Salt Ayre, and thus potentially everywhere, has become an important and healthy local occasion, and exactly the kind of thing which should be more widely promoted. Sunday, 5:30 am, the alarm doesn’t rouse me, I’d turned it off by mistake sometime during a broken night’s sleep, but I’m awake anyway, waiting for dawn to break yet slowly realising that I’ll be riding before it does. Downstairs everything is waiting, prepared the night before. I’m remembering how to do this. My bike is cleaned if not perfectly adjusted (note again, to book myself onto a bike maintenance course), my clothes laid out. I’m here, doing the stuff you have to do to participate in a sport. First I feel pleased with myself, then I feel smug for feeling pleased with myself, and then I reassure myself there’s nothing hollow about this, and I feel pleased over again. I eat a bowl of muesli and yoghurt, drink a mug of tea, make an expresso and leave it to cool whilst getting ready to leave. I’d planned to leave at 6:15. By 6 I’m worried I’ve not left enough time to reach the race. It’s still dark. I find a front and back light and fumble them onto my bike. Swig the coffee, then off, out of the still sleeping house. I love riding when the streets are empty. I love riding in the night. Whenever I do, I remember I don’t do it enough. Over the Lune, north out of Lancaster into the purple sky. I’m riding 20 miles to a race, the kind of thing I’ve not done since I was a kid. 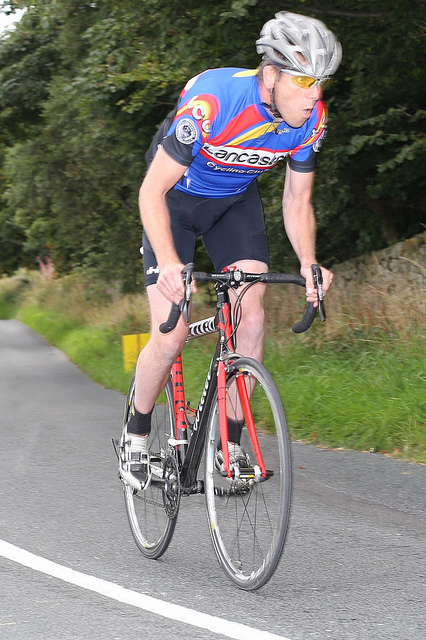 It’s Lancaster CC’s open 25 mile time trial on the Levens and Lindale course. My start time is 8:09am. The A6 slumbers. 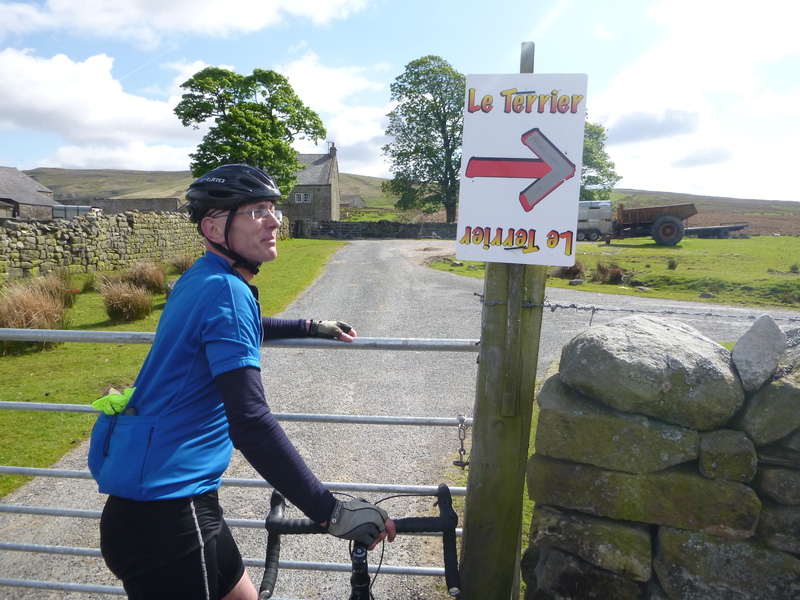 I spin the gears through Slyne-with-Hest, Bolton-le-Sands and Carnforth. A voice is behind me. It’s Graham Atkinson’s; he’s riding to his marshalling duties. He rides fixed, 48×18. Turning the pedals at 100 revs a minute, he rides 20 mph. We ride side-by-side and chat, I drop back for a tow, we chat again, I break a sweat, shout to Graham that I’d better drop back, and he soon disappears into the road ahead, a lone figure against a still lightening countryside. Graham trains as fast as I race. This year. I don’t want to overdo it before I start. I haven’t ridden a 25 mile time trial yet this year. I’ve one today, then another next week. I rode one last year, in 73 mins, 33 seconds. My goal at the start of this year was to ride the distance in under 70 minutes. I find the start. Two long lines of cars are parked either side of the lane. Some riders warm up on rollers pulled from car boots still gaping in the cold morning air. 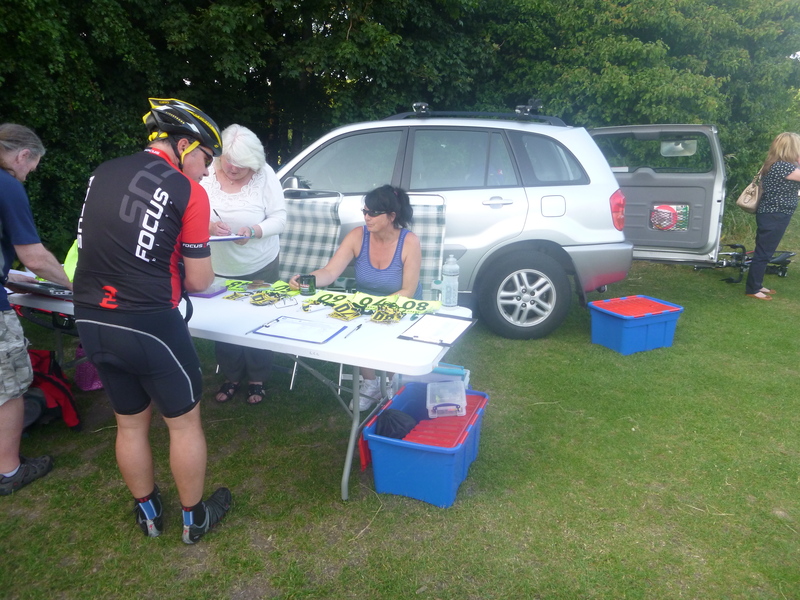 I sign on and collect my number from event HQ, a gazebo with table and trophy standing silent there. The team of marshals huddle together, awaiting instructions from race organiser Ken Peasnell. The first stretch is downhill. I’m up to 32 miles per hour, but trying not to overdo it. 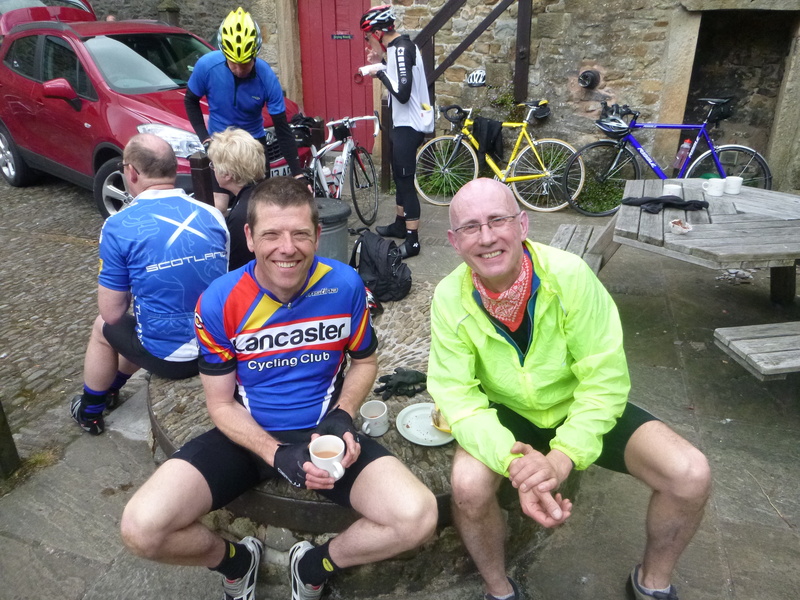 Less than 2 miles into the race, Richard Handley, who started a minute behind me, comes past; my mind starts calculating, ‘at that pace he should beat me by about 13 minutes’ (he does, and more … he’s an excellent young rider). It strikes me as a slightly strange way to spend a Sunday morning, hammering as hard as I’m able – along with around a hundred other people – along the A590 in south Cumbria. But then I start wondering what all the people inside all the vehicles coming past me are up to, and everything – car boot sales, mountain walks, tourism – also starts to seem pretty weird. I beat my target. 68 minutes, 12 seconds. I’m chuffed. Everything’s relative. Here, among these people, that’s slow. Compared to where I was a year ago, let alone five years ago, it’s not at all bad. I see Judith at the finish. She’s done around 1:06:30. I congratulate her, she congratulates me. I say I’d better get home, 68 miles under my belt, for a family day out. The sun is shining, it’s a glorious autumn day. She says she’d better get home, see if her kids are up yet. Not bad, this cycling life, I think, and I bet she does too .. 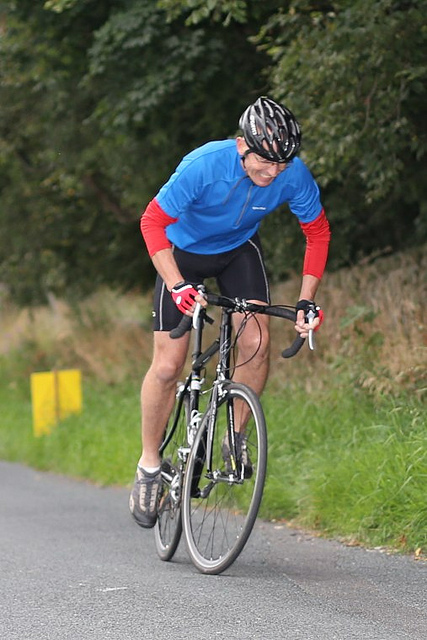 In British club cycling, autumn is the time of hill climbs. A hill climb is a race, by yourself, against the clock, up a hill. Simple really. Simple, short, and tough. My first ever competitive cycling experience was the English Schools Cycling Association Hill Climb Championship near Matlock, Derbyshire, in – oooh – 1983 or 4, I guess. I was a student at Solihull Sixth Form College, I was new to the sport, I was riding a cheap Raleigh 10 speed, and I don’t think I’d ever seen – let alone ridden – a 1 in 4 hill before. I didn’t make it to the top. I don’t remember feeling embarrassed; after all, I’d given it a go. I do recall grunting men on fixed wheel bikes grinding their ways to the top, and that first unforgettable feeling of trying – and failing – to ride up an asphalt wall. 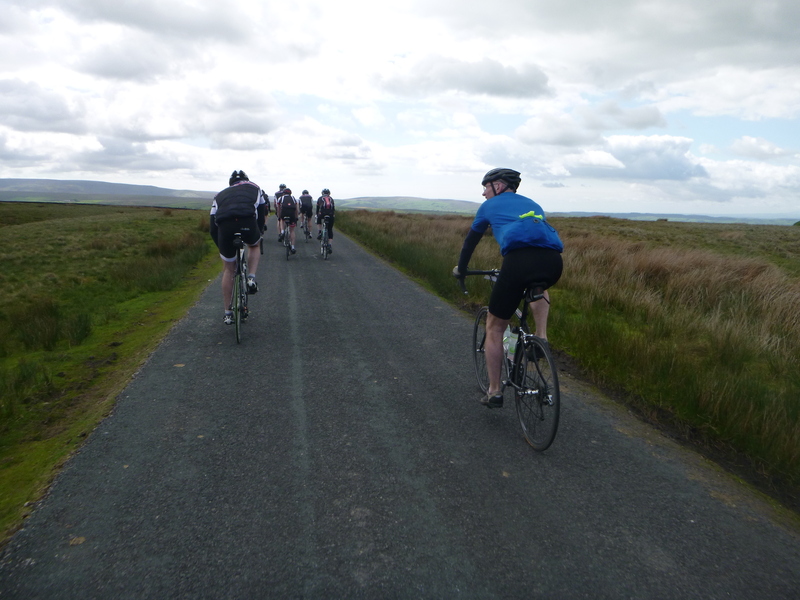 Last night was the second of Lancaster Cycling Club’s annual club hill climbs. It’s become my Club, and this year I’ve got a bit more active, going for ‘training rides’ rather than simply ‘rides’, and riding quite a few evening 10 mile time trials. But I’m still this side of plump, and I was frankly terrified of the prospect of trying to haul my mass uphill at speed. It’s only a year ago that the prospect of riding up Jubilee Tower, last night’s climb, at any speed, was daunting enough. But there were also good reasons to have a go: becoming more involved in the Club has increased my commitment to support events; my main training partner, Jon Barry, fancies himself on the hills and was keen to have a go; and for the first time in more than 20 years, I’m planning to train through winter, and to have a proper go at racing next year, so it makes sense to set some times which I can use as benchmarks for my progress next season. Part one was last week – the short, steep climb of Condor Bottoms. I surprised myself at the speed at which I set off, but felt reasonably OK. Then I saw the bunch of spectators at the hairpin bend up ahead, waiting at perhaps the steepest section of the climb. Obviously you want to look your best as you go past a watching crowd, so I tried very hard to look calm, graceful, dignified, fast. Ha, ha, ha … I’m sure they weren’t deceived, and as soon as I was past them, my legs turned to jelly. Still, I clawed my way to the finish, and though I was slow, I beat 3 minutes, which was my personal target. Although it involves struggle and a certain pain, I loved it. I loved riding hard up a hill which only a year before I was scared to tackle at all. I loved the rare feeling of racing without a helmet (it’s all uphill, after all). I loved needing continuously to judge whether I was overdoing it or underdoing it, and adjusting my effort accordingly. I loved knowing the steepest part was over, and feeling my speed increase with the softening of the hill. I loved overtaking and shouting encouragement to Jess, to be myself overtaken and have the encouragement of her Dad Graham. I loved the feel of sweat dripping from my chin. I loved finishing, being at the finish, watching others finish, the post-race talk. I loved seeing the care and commitment of people such as Bob Muir – time keeping again last night – who invest their love in the preservation of this magical sporting world. One hundred and fifteen years after the last one, the second bicycle boom is underway up here in the north west of England. I’ll write much more about this over the coming weeks, months, years, I hope. But the growing popularity of club cycling is one aspect of it. Last night was beautiful – I mean really beautiful – to see. Women, men, girls and boys, all ages, mothers and fathers with daughters and sons, old hands and novices, gentle calls of encouragement drifting across the dipping sun of a glorious autumnal evening. 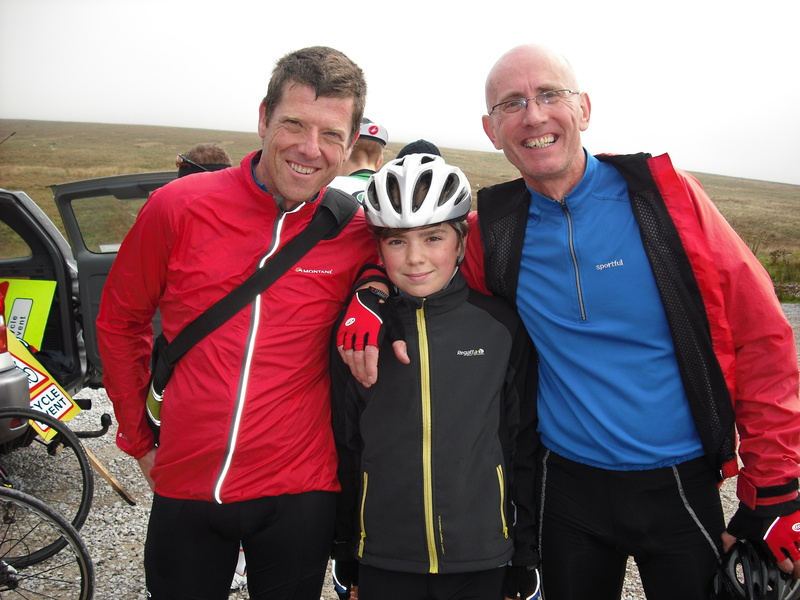 I hope I am there next year, I hope I am a little faster next year, I hope that perhaps my son Bobby will ride out with me then, and I hope that cycling’s revival will be that bit stronger, clearer, more self-assured. And I count myself very, very lucky to be able to hope for all these things. There are many reasons to ride a bike, and they include these.